How To Take The Best Care For Your Whiteboard? How is a whiteboard made? Growing up, you were probably extremely familiar with chalkboards or blackboards, and as you grew up, transitions were made to write on the now common whiteboard. There’s something peculiar about whiteboards – the ease with which the marker glides on the surface – the vibrant colors against the white canvas. It’s easy to reckon as to why they have now become commonplace in classrooms, meetings, and boardrooms. Some even have whiteboards at home to help them with the ease of working out problems and for ideation – I know I do. Markers produce a more comfortable writing sound as compared to chalk sticks. Now, not every whiteboard is created equally, and to choose the right one can be complicated, especially when there is so much information out there. To find out which is the perfect fit for you and your needs, we’ve compiled an extensive list of 10 whiteboards with the benefits and cost of each included in this list. Also, if you need a whiteboard markers, check out article here. This is one of the smaller sized ones that is accompanied by a sturdy high-quality steel pipe stand which makes for easy writing and erasing. If you plan on buying this for your kids, the easy adjustment of the height of the tripod makes it the perfect fit for them. The size and easy portability allow it to be moved to any environment – be it your personal office, home, or even a cafe. Being magnetic, it allows for a ton of variation in its usage i.e. from being a bulletin board for your second-grade classroom to welcoming customers into a coffee shop with a daily specials menu. The combination of the whiteboard, tripod stand, eraser, 3 markers, and 6 magnets make it a steal at the price. Reviewers also lauded the customer service that was extremely helpful in replacing metal parts. With an average of 4.5 stars out of 5, this is one of Amazon’s best-selling dry erase boards and with good reason. Made in Germany, the metal of the whiteboard has a natural thickness that has been actualized by enhancing the natural oxidation process – with the same technology being used to protect satellites from the outside environment. This makes the board surface extremely suitable for those who hate it when the marker ink penetrates through the board, leaving behind faint stains that cannot be cleaned. It also has a movable pen tray at the bottom of the whiteboard which itself is protected by an aluminum frame. You also don’t have to worry about the kind of cleanup required since it can be easily wiped with either a dry or a wet cloth. Available in 4 different sizes, this doesn’t just include the whiteboard with the classic aluminum frame, it also includes the eight magnets and 3 dries erase markers. Why include magnets? Well, because this large dry erase board is magnetic – one of the reasons behind the higher price point. Their boards promise to be long-lasting, with a premium whiteboard surface that is suitable for most branded dry erase markers, with the ink coming off smoothly. The magnetic board allows for smooth writing that is easy to clean and comes in several different size options. Before you worry too much about the price point, they offer a two-year warranty on their product. And in the event of a replacement being a necessary post that, they offer discounts on the replacement boards. The customer service is also extremely helpful, and generous with product replacement should it arrive damaged. Reviewers also praise its easy installation, with clear designated areas for the screws. Another magnetic dry erase board, its detachable marker tray can be attached to either of the whiteboard’s four sides, which makes it perfect for parents who want to keep it out of the reach of their kids. The same goes for teachers. The amazing anti-scratch magnetic surface allows for the easy attachment of notes, pictures, memos, and calendars, via magnets. The glassy smooth whiteboard is compatible with all kinds of dry erase markers and prevents leftover ink stains after wiping, even if the wipe down of the board is done weeks later. This means you don’t have to worry about immediately erasing your ideas when compared with other mediocre boards. Reviewers also praised the shipping, with the whiteboard wrapped in bubble-wrap and protected by thick cardboard that acts as shock absorbers. We recommend that you remove the protective peel off skin underneath the metal before fixing it up on the wall. Available in eight different sizes, with options of buying packs of 3, this makes it the perfect choice for those who need more than one. It is a sleek and durable non-magnetic writing board that allows for smooth and clear writing that is easy to display. The installation is easy, with clear and easy to read instructions, with a wall-mount screw kit also included. The large size also allows for more than one person to use it, with the four corners protected by anti-scratch silver aluminum frames. Reviewers praised the easy wiping (even without cleaning liquid), with some claiming that the whiteboard looked like brand new even after one month of heavy use. There are warnings out there, however, to ensure that the right side was being used as the whiteboard, with some reporting that there was confusion about which side to use. Although it is smaller when compared to others on the market, this whiteboard has everything you might want in one – its durable, stain, and a scratch-resistant surface is perfect for those with kids at home. The writing can be wiped off easily, with any stains left being removed with a simple swipe, making it suitable for both wet and dry erase markers. The strong magnetic surface allows for easy attachability of visual add-ons like pictures, charts, notes, etc.. The glossy surface allows for amazingly perfect color contrast, enhancing the overall visual benefits of owning this board. 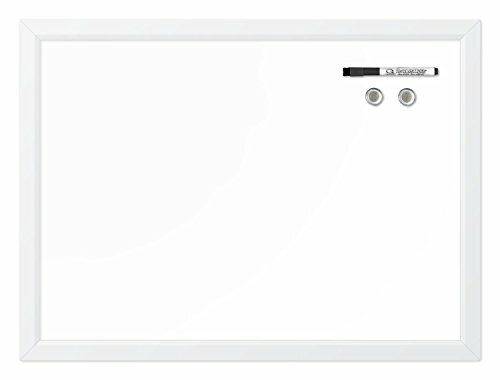 Award winning, this whiteboard has also been tested according to stringent quality customer protection standards in Germany. If you still have any doubts, the only critical reviews on Amazon complain about the smaller size – which is more than made up for by the price tag and the amazing quality of the dry erase board. With 1,306 customer reviews averaging 4.3 stars out of 5, this proves to be one of the best value-for-money whiteboards out there. 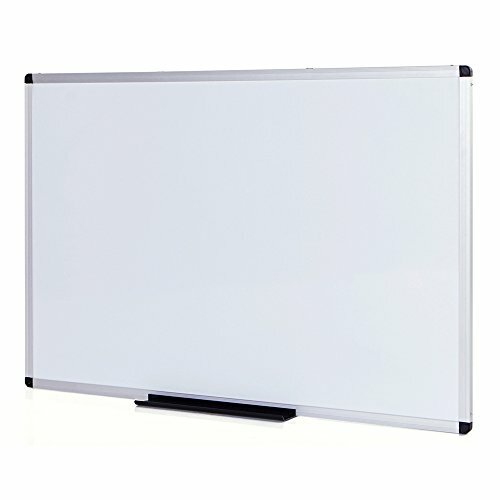 With a back-frame finish, this whiteboard is perfect for personal at-home use, owing to its size and functionality. Its versatility of use is also proven by the fact that the board is magnetic in nature, and that it can be hung either vertically or horizontally. They are easy to attach and make for very easy cleaning. It also comes with a low odour marker that is easy to erase and dries quickly, perfect for small whiteboards like this. Quartet is also one of best whiteboard brands out in the market which means that you are pretty much guaranteed a good quality whiteboard. First things first, this whiteboard comes with a 50-year surface guarantee – and that’s a bold statement from the manufacturer. It only goes to show their belief in their product. Made from porcelain, this premium quality whiteboard is ideal for those looking for a durable and long-lasting whiteboard. It is perfect for heavy use since it is easy to erase, with no possibility of staining or ink residue. It is also scratch and dent-proof. The surface is magnetic which would allow for ease in the creation of an interactive and visual presentation. It also possesses that classic design which will fit perfectly in any environment, with a beautiful surface that is easy to write on. For boards such as these, we recommend that you buy specialized cleaning liquid to let it last all of the five decades. Reviewers also praised the surface material and the lack of ghosting left behind by the marker ink. This makes for a great value for money set since it doesn’t just include the magnetic dry erase board but also 5 colorful markers and one eraser. It promises to be the best stain-resistant whiteboard of its size, and the average 4.5 starred reviews show why it is one of the best dry erase whiteboard easel stands there in the market. It is extremely convenient since the markers and eraser are magnetic, and so, it is easier to use the whiteboard without having to for these items and scrounging for them, everytime you lose them. The size and easy movability make it an apt choice for those looking for a smaller sized whiteboard, perfect for small group settings and for personal use. 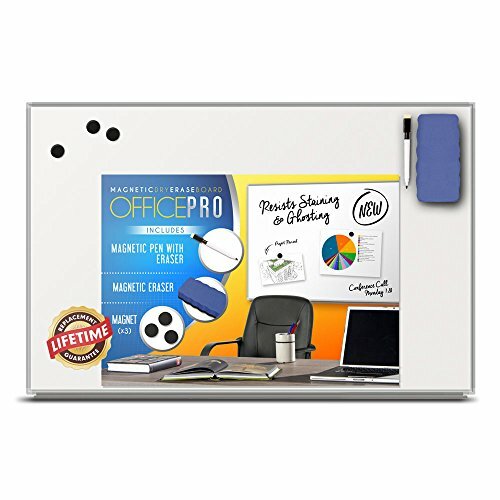 Although at first glance this appears to be more expensive than the usual standard whiteboard, what makes this great is the larger size and the fact that you can use both sides of the whiteboard, since you can flip to either side. It has an easy flip and lock design which ensures that writing on and erasing the marker ink is of no issue, and leaves behind no residue. This whiteboard is perfect for workshop and small team settings, where brainstorming can go to extreme lengths, thereby requiring a smaller area to move about but a larger space to write on. Something to mention is that it is a rolling whiteboard with a good locking mechanism. It also includes a marker, eraser and three magnets, with a tray for accessories. Even though the list above showcases some of the best whiteboards on the market and the benefits of each, if you’re still in two minds – read on to learn more about whiteboards in general. We hope that this will help you make a decision. One of the best tools for organizing and displaying visual information is a whiteboard. You don’t need to waste your hard earned cash buying a new whiteboard. You can create a good one for less than half the price of buying a new one. For approximately $30, you can create an awesome one but it depends on the materials used. Let’s see how you can create one in easy steps. Determine the dimensions. It is up to you to decide which size is suitable for you. If you need a large whiteboard, buy multiple sheets. Buy melamine sheets. These can be found in hardware stores available locally. Melamine is a material with a plastic-like coating. You may at times confuse melamine for tiles because their textures are similar. Buy a sheet that has a smooth finish because it looks good when written on and can be erased easily. Use Lexan for clear boards. Try out thinner polymer materials. You can easily find such materials in home improvement stores. Lexan is great because it is light and has a glossy finish. Brace your board if necessary. Since the material is thin, it will be somewhat flexible. To increase stability to a bendable board, glue a backer board to it. Resize the board. Cut the board if you want it to be less than 4’x8’. Move the saw slowly to avoid damages. Also, cut the backer board if applicable. Use hangers, screws, or glue to hang the board. Ensure that it is stable by placing it on a smooth wall. The board is ready for use. If you feel like dividing the board into several parts, do so to fit all your needs. Automotive pin striping is a great option for sub-dividing the board into different parts. There are a lot of good reasons to get a whiteboard for your home. One of them is that you can place one in your kitchen and use it to keep track of recipes and groceries. So when you need to restock something you can leave a note for yourself or if you’ve made notes about a recipe you can have it on display so that you don’t need to worry about forgetting it. Another great reason to get a whiteboard is you can also place one in your bedroom so that you can list all the chores and errands you need to get done. We all get really busy with our day to day lives, so having reminders in front of us is a great way to make sure we don’t forget about anything important. You can also use whiteboards as a convenient way to leave reminders for other family members for urgent household tasks. So now that we know how helpful whiteboards can be, the next question on your mind must be ‘how to choose a whiteboard?’ This is a fair question because there are various types of surfaces and boards available. You can decide which is best for you based on your needs. Made from plastic, it easy to write on and wipe off. Those who don’t plan on using their whiteboards much would find this the perfect material. It is also cheaper since persistent use will result in wear and tear of the surface, with time causing the reside of the marker ink to reside in the board, with no cleaning being able to remove it off. Hence, while it is cheaper, it can become costly in the long run. These are our personal favorite for their smooth, glossy finish and their durability. These last longer and are and perfect for long term use. This is also because the constant wiping is less likely to leave behind ink residue, unlike whiteboards made of melamine. They don’t stain and also don’t scratch as easily. These are the highest quality whiteboards you can find. They have an easy to clean surface that is suitable for long intensive work where you’re not going to wipe off the marker ink immediately. They are also scratch resistant, and these make it the perfect fit for boardrooms. Another feature that we haven’t included with the above three are whiteboards that are magnetic in type. You would have seen many of the variety in the 10 best whiteboards we have listed above. The reason being that any of the above three whiteboard materials can also be made magnetic. Magnetic whiteboards are perfect for those who want more visual elements to be added to their whiteboards such as pictures, graphs, notes, timetables, etc.. Depending on the type and size of whiteboard you require, accordingly, you should select the dimensions. For example you shouldn’t be getting a large whiteboard more fit for a boardroom when your kids are the ones going to be writing on it. You can also think about how long you might require this board for – if you’re only planning on a few months, maybe to occupy the kids during summer vacations, you can go for ones at the cheaper end of the scale. However, if you plan on using them in your meetings for years on end, be sure to go for porcelain surfaces. Check out the reviews. Do reviewers complain of faint residue left behind after frequent cleaning only after a few weeks? If so, you know which whiteboard NOT to buy. You want your whiteboard to last months, if not years, which means that cleaning should be simple and always leave behind a smooth surface free of any ink stains. Ordering a whiteboard online can come with its risks. Be sure to only buy those with warranty. We don’t just those who promise product replacement in case it arrives damaged, but the ones that go beyond that. The warranty can last from as little as 12 months to 50 years! This not only allows you to breathe a little more easily when the time for replacement arrives but also assures you of the quality of the product. Some boards are magnetic, while others feature grid patterns that are perfect for classrooms. According to your needs and the use for which you will be requiring the whiteboard, ensure that you choose accordingly. For those who require boards on which projected presentations will be shown, we recommend a thicker whiteboard. 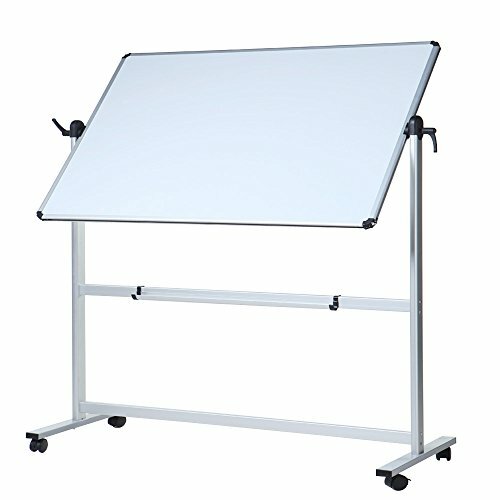 The ideal whiteboard would be of a smaller size, with a detachable marker tray that can be attached at the top frame out of reach from kids, and long lasting since you will require more frequent wiping than usual. Just because you probably need a smaller version, doesn’t mean that you go for a cheaper version – especially since whiteboards at home are more susceptible to wear and tear owing to kids who love to mess around. We recommend larger whiteboards, that have proven results of easy cleaning, especially since the extreme frequent use can lead to faint residue that becomes difficult to clean even with specialized cleaning liquid. We would also recommend magnetic whiteboards, since part of it can act as a bulletin board to attach announcements, time tables, pictures, etc. The size of your dry erase board would really depend on the size of the team. For smaller teams and small workshops, we suggest moveable whiteboards that are propped up on stands that allow for easy visibility and more collaboration. With a larger sized team, we would recommend a more appropriately sized wall mounted office whiteboard. A large dry erase board would also allow more than one person to work on the whiteboard, which would result in a higher productivity. A thick matte-finish would also allow for clear visual presentations. This could be placed either be in the confines of your personal office or in the comfort of your own home. A smaller sized whiteboard, best propped on a stand, is perfect for your needs – especially for those who work from home. You could even go for a larger sized one if the need arises. This allows for brainstorming and planning for your own personal goals. The size of the whiteboard would also depend on the space available to you. Now, the whiteboard is often accompanied by the standard black marker. You can continue with the same – however, if you plan on brainstorming or being a little more creative, we would recommend buying markers of various different colors – red and green being our favorites to suggest. You can either go with a dry or wet cloth (depending on the type of dry erase board you own, but if you want your board to last longer with a lesser possibility of ghosting or ink residue, we recommend that you buy a proper whiteboard eraser. Often, one accompanies the whiteboard that you order. This is heavily recommended with the porcelain steel whiteboards that can last up to fifty years when cared for properly. A good cleaning schedule with the proper use of specialized cleaning liquid is essential to prevent staining or ink residue. With aluminum-framed whiteboards, a small tray to hold your markers often accompanies the packaging. It is usually detachable, with the tray being attachable at either of the four sides. 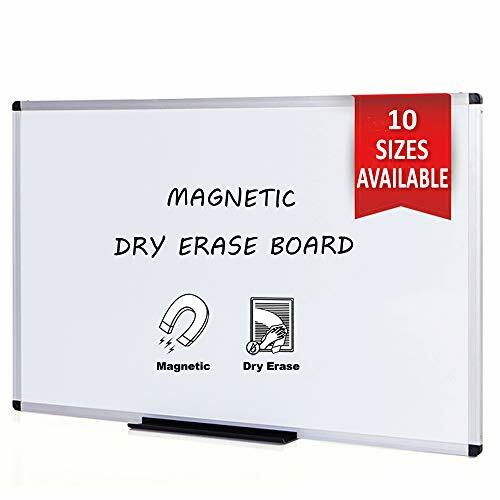 Magnetic whiteboards, on the other hand, can be popular solely for the fact that you can let the magnetic markers rest anywhere on the board, which makes for quicker writing and prevents loss of marker. The tripod stand is optional, usually needed for those with smaller sized whiteboards. Be sure to go for something durable – one that will last long. We highly recommend that you get one with wheels at the bottom so that it’s easy to move around, with a locking mechanism so that it stays in place as you write or erase. Again, this is also optional for those with magnetic whiteboards. Magnets allow you to attach external items such as pictures, graphs, notes, timetables, to-do lists, etc. This is perfect for kids at home and in classroom settings since it makes for easy interaction and visual stimulation. Warranties can last from a few months to 50 years, depending on the whiteboard you buy. This means that if properly cared for, your whiteboard can last decades. That is, only if you care for it properly and create frequent cleaning habits that will leave your whiteboard smooth and as clean as the first time it was purchased. Buy the markers that are specifically designed for your whiteboard – if your dry erase board specifies no wet markers, it’s best to be using the right kind. And we definitely recommend that you never use permanent markers since the ink can often never be removed no matter how much cleaning liquid you use. Another important suggestion is that you frequently buy new markers so that fresh ink is often used. Some whiteboards will call for only any cloth or eraser while others might call for a specific type of cleaning liquid and a certain kind of cleaning cloth. Specialized whiteboard cleaning liquid help to break down the ink residue while not wearing away at the surface of the board. We highly recommend that you review the cleaning instructions which are pertinent to keeping that smooth look forever. In fact, we recommend that you do it daily. This will almost immediately ensure that there are no pesky ghost residues left behind by the markers. If you’re the kind of person who will have ideas and brainstorming sessions stewing away on the whiteboard for 2 months after first writing them down, we highly recommend that you go for higher grade materials like porcelain which would last longer with no residue. As always, be sure to wipe down your board as frequently as you can. See, if you’re not planning to use your whiteboard too often, don’t care too much for the ghosting left behind by ink markers, and plan on discarding the whiteboard soon after a few months, feel free to go ahead with the cheaper option. If it’s the opposite, we recommend that you run in the opposite direction. The problem, with cheap whiteboards, is that they tend to be of poor quality (hence the lower price), to the point that no amount of cleaning will remove the residue left behind by your markers. Just a few months of use will cause cracks and bumps to appear in the board, leaving you filled with regret over having bought a bad quality dry erase board. And after discarding, you’ll eventually have to end up buying a good quality whiteboard. A good quality whiteboard is worth the price since it is sturdy, durable, and if handled with proper care, it will last you decades. Now you know what to look for when buying a whiteboard for your home. Having a whiteboard in your home is quite handy for keeping track of your important tasks. While you need to do a little research while choosing a whiteboard, at the end of the day you’ll see that having one certainly wouldn’t hurt. Whiteboards are also referred to as dry erase boards or marker boards. Interestingly, people started using them at around 1990. However, they were first manufactured commercially in 1966. In the past few decades, people have been choosing to use them instead of traditional chalkboards. Whiteboards have numerous benefits. For instance, they do not cause allergies and environmental pollution like chalkboards. The two types of whiteboards are porcelain and melamine that are manufactured differently. There durable and strong whiteboards that are made of three layers. There is the white surface used for writing, a moisture barrier, and the substrate. There are people who use magnetic accessories with these types of whiteboards. The three layers of material used in the manufacturing of these whiteboards are cut and framed accordingly. The enameled surface used for writing is a combination of glass, cobalt, and nickel. All these components are heated in high temperatures. The heat used must be more than 1700 degrees Fahrenheit. After heating, the materials form a mixture that is applied to steel sheets. The mixture easily bonds with steel sheets. There are manufacturers who use steel mesh while others use a solid sheet. It all depends on the availability of raw materials, cost incurred, or the most preferred material according to the company. Both materials are great all the same. The heated mixture that bonds with steel sheets are allowed to cool down for a few hours. Afterward, it is cut into large rolls that are later taken to whiteboard manufacturers. Whiteboard manufacturers usually glue the writing surface to a stronger backing substrate. In most cases, the backing substrate used is a particleboard, fiberboard, or a hardboard. The backing is done by manufacturers to increase thickness. Backing, in this case, is done in several layers until the desired thickness is attained. A non-porous backer is then used as a cover. Once the sheets are ready, they are stacked while at the same time allowed to cool so that the weight can compress the sheets. When the glue on the sheets cures, they are cut to the desired sizes and shapes. Framing is then done to form complete whiteboards that are then shipped out to different distributors. Buying a whiteboard doesn’t have to be complicated. When you understand the kind of whiteboard you will need and the features you require from it, you’ll be able to choose an appropriate one. The type of environment it will be placed in, the uses required for it, and the frequency of usage – all of this will factor into choosing the right whiteboard for you. The only feedback we can leave you with is that you choose one of high quality and set aside a good cleaning schedule that will allow for your whiteboard to last for many years.